District Heating networks Base Substations. 50 ÷ 6.000 kW. District Heating networks Base Substations. 50 ÷ 1.500 kW. 18÷35 kW heating and 10÷50 kW Hot Domestic Water production. 18÷40 kW heating and 10÷50 kW Hot Domestic Water production. 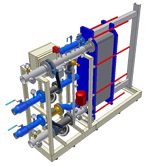 10÷60 kW heating and up to 80 kW Hot Domestic Water production. 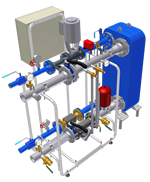 30÷150 kW heating and up to 180 kW Hot Domestic Water production. Permanent or temporary installation. 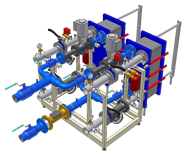 Funcional in order to keep Heat Exchangers efficient and avoid maintenance costs.